The Kingston HyperX Fury memory kits are all plug and play memory, but is also compatible with AMD systems. While you can change the frequencies in the BIOS manually, Fury is essentially "no fuss" plug and play without the need for BIOS or memory profile selection. Only one internal SPD profile is available so it should be as easy as powering up the system, and watching your settings flash at the BIOS boot up screen. 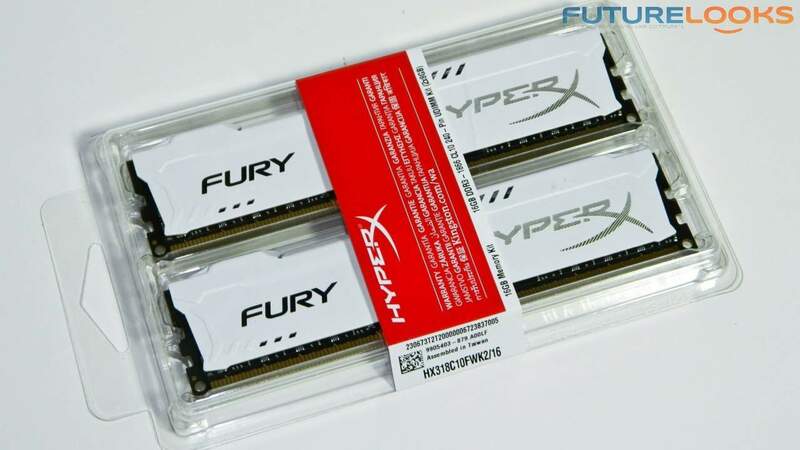 The Kingston HyperX Fury 16 GB 1866 MHz DDR3 kit offers simplicty, higher frequencies, more memory bandwidth, a very attractive design, and an value oriented price point. Let's put them to the test! The Kingston HyperX Fury series includes 1333, 1600 and 1866 MHz grades. Since Kingston only manufactures 4GB and 8GB modules, the largest capacity Fury kit is 2 x 8GB (16 GB), and we have the high end 1866 MHz kit in the lab. Stock timings will vary depending on the frequencies. Currently, both the 1600 and 1866 MHz kits are CL 10 (CAS Latency) timed kits. All 1333 MHz kits feature CL 9 timings. New JEDEC standards put the memory at 1.5 volts operating power. Kits come in black, blue, red and white. All of these colors match some Z97 motherboard out there. While all the kits look great, it's the 1866 MHz white kit we're evaluating today. Simply put, it really adds something to the system when viewed through the side window. Unfortunately, Fury doesn't come in DDR4 quad channel kits for X99...yet! Pricing corresponds mainly with frequencies followed by capacity. The HyperX Fury 8GB 1600 MHz kits start at $75 US and 8GB 1866 MHz kits at $83 US. Higher capacity 16GB 1600 MHz start at $154 and 1866 MHz kits are $160 US. In any of these cases, you're only paying a little more for the higher frequency "good stuff". To test out the PnP functionality of the Kingston HyperX Fury modules, we've put together the following system. CPUZ was used to verify whether or not memory frequencies and timings are correct. The SPD tab will communicate the programmed frequencies within your memory kit. The memory tab verifies what frequency you're actually running on your motherboard. If your CPU supports 1600 MHz DDR3 by default but you're running at 1333 MHz, you can change the frequency for more performance. Let's do that next. Above, you can see that the XMP profile option is grayed out since the PnP memory doesn't have XMP profiles. Your board and memory should default to 1866 MHz. Occasionally, a board might default to the Intel default 1600 MHz. If this happens, you can still set the frequency manually in the BIOS. Both methods were tested and the memory worked great. By PnP design, the Kingston HyperX Fury found 1866 MHz along with the correct 10-11-10 timings on our GIGABYTE GA-Z97X-UD5H quickly with a single boot. There is a little extra performance unseen lurking beneath those angelic white heat spreaders. After manually changing the CL to 9, the system was stable running test after test. No extra voltage was needed either. To answer the question of potential overclocking, the Kingston HyperX Fury PnP kit provided a perfectly stable 2000 MHz frequency with 11- 12-11 timings again without increasing the memory's voltage. This is one of the great benefits of a very capable Z97 motherboard. Anything higher demanded too high a CL timing to benefit the system. All this means is that the memory has more under the hood to offer exceeding specs. We'll take it! Now let's fuss over some benchmarks!